This article is about the men's team. For the women's team, see Romania women's national basketball team. The Romanian national basketball team (Romanian: Echipa națională de basketbal a României) represents Romania in men's international basketball competition. They are administered by the Romanian Basketball Federation. The national team has qualified for both the EuroBasket and Summer Olympics. Their best finish at either event was at 5th place for the EuroBasket, in 1957 and 1967. Romania though, has yet to qualify for the FIBA World Cup. 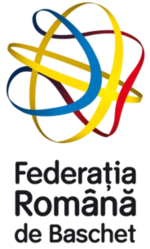 Romania is one of the founding members of the International Federation of Basketball (FIBA) and has one of the world's longest basketball traditions. At the first European Championship in Geneva, the Romanian national team finished in last place in the then 10 team tournament. Losing all three of their games; 42-9 to Switzerland, 66-23 to France, and 24-17 to Hungary. Romania returned to the European championship twelve years later in Prague, for the EuroBasket 1947. They finished with an record of 1-2 after the preliminary round, eliminating them from championship contention but they got their first ever EuroBasket win against the Netherlands. The Romanians added two more in the classification semifinal, defeating Austria and Albania. This put them in a classification match against Italy for 9th and 10th place, which Romania lost 55-39. The national team thus placed tenth again, but this time they had outranked four teams to do so, due to the expansion of the tournament to 14. The Romanian national team entered the EuroBasket 1951 in Paris, but withdrew before any games were played, so official records gave them three preliminary round losses, each with a score of 2-0. Romania managed to qualify for the 1952 Summer Olympics in Helsinki, where the national team finished 23rd. It was the first, and the last time they qualified for the Olympic Basketball Tournament. The EuroBasket 1953 in Moscow was the next European tournament in which the Romanians actually played. They finished in 3rd place in their preliminary round group with a 1-2 record, helping them to advance to the classification rounds. They won 3 of their 4 games there, finishing in a three-way tie for the top spot of the group. They lost out on the tiebreaker, though, and were relegated to the 13th-16th place semifinals. Winning that game and their next, the Romanians finished in 13th place of the 17 teams in the tournament. Romania was much more successful two years later, at the EuroBasket 1955 in Budapest. A preliminary round loss to the global power house Soviet Union mattered little, as the national team won their other three preliminary matches against Sweden, Switzerland and Luxembourg to take second place in the group behind the Soviets to advance to the final round. There, they won games against Poland and Yugoslavia to finish 2-5 in the final round to take 7th place in the 18-team tournament. Romania came within a single point of winning their preliminary pool at EuroBasket 1957 in Sofia, losing to Hungary in the narrow match. They beat their other two opponents in Belgium and Finland, to finish in second place in the pool to advance into the final round. There, they matched up again with Hungary, but the game wasn't as close as the hungarians cruised to an 76-61 victory. The national team also lost to the other three pool winners, to finish with an 3-4 record to end the tournament in 5th place. The team repeated its most successful campaign at the EuroBasket 1967 when it finished 5th again. The following years, the team had some successful performances but after 1987, it ceded completely from Europe's elite events. After 30 years of absence, Romania returned to the EuroBasket in 2017 when the country gained hosting rights alongside Finland, Israel and Turkey. However, the national team ended its participation with five losses in its five games played. Roster for the EuroBasket 2017. The following is the Romania roster in the men's basketball tournament of the 2017 EuroBasket. Andrei Folbert - First Romanian Basketball "Maestru Emerit Al Sportului"
^ Men's Basketball ROMANIA's National Team Competition Set, Ancada.com, Retrieved 22 May 2016.